A unique book that describes the practical processes necessary to achieve failure free equipment performance, for quality and reliability engineers, design, manufacturing process and environmental test engineers. This book studies the essential requirements for successful product life cycle management. It identifies key contributors to failure in product life cycle management and particular emphasis is placed upon the importance of thorough Manufacturing Process Capability reviews for both in-house and outsourced manufacturing strategies. The readers? attention is also drawn to the many hazards to which a new product is exposed from the commencement of manufacture through to end of life disposal. 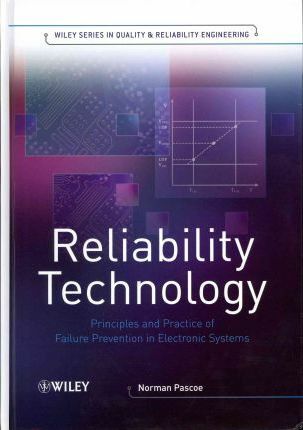 This text demonstrates how to achieve failure free equipment performance in electronic systems by studying the essential reliability technology disciplines that contribute to failure free product in design, development and manufacturing. It presents detailed accounts of established "hands-on" procedures for understanding potential failure mechanisms in materials and components, and identifies the many hazards from new product manufacture through end-of-life disposal. Foreword by Michael Pecht. Series Editor s Preface. Preface. About the Author. Acknowledgements. 1 The Origins and Evolution of Quality and Reliability. 1.1 Sixty Years of Evolving Electronic Equipment Technology. 1.2 Manufacturing Processes From Manual Skills to Automation. 1.3 Soldering Systems. 1.4 Component Placement Machines. 1.5 Automatic Test Equipment. 1.6 Lean Manufacturing. 1.7 Outsourcing. 1.8 Electronic System Reliability Folklore versus Reality. 1.9 The Bathtub Curve. 1.10 The Truth about Arrhenius. 1.11 The Demise of MIL-HDBK-217. 1.12 The Benefits of Commercial Off-The-Shelf (COTS) Products. 1.13 The MoD SMART Procurement Initiative. 1.14 Why do Items Fail? 1.15 The Importance of Understanding Physics of Failure (PoF). Summary and Questions. References. 2 Product Lifecycle Management. 2.1 Overview. 2.2 Project Management. 2.3 Project Initiation. 2.4 Project Planning. 2.5 Project Execution. 2.6 Project Closure. 2.7 A Process Capability Maturity Model. 2.8 When and How to Define The Distribution Strategy. 2.9 Transfer of Design to Manufacturing The High-Risk Phase. 2.10 Outsourcing Understanding and Minimising the Risks. 2.11 How Product Reliability is Increasingly Threatened in the Twenty-First Century. Summary and Questions. References. 3 The Physics of Failure. 3.1 Overview. 3.2 Background. 3.3 Potential Failure Mechanisms in Materials and Components. 3.4 Techniques for Failure Analysis of Components and Assemblies. 3.5 Transition from Tin-Lead to Lead-Free Soldering. 3.6 High-Temperature Electronics and Extreme-Temperature Electronics. 3.7 Some Illustrations of Failure Mechanisms. Summary and Questions. References. 4 Heat Transfer Theory and Practice. 4.1 Overview. 4.2 Conduction. 4.3 Convection. 4.4 Radiation. 4.5 Thermal Management. 4.6 Principles of Temperature Measurement. 4.7 Temperature Cycling and Thermal Shock. Summary and Questions. References. 5 Shock and Vibration Theory and Practice. 5.1 Overview. 5.2 Sources of Shock Pulses in the Real Environment. 5.3 Response of Electronic Equipment to Shock Pulses. 5.4 Shock Testing. 5.5 Product Shock Fragility. 5.6 Shock and Vibration Isolation Techniques. 5.7 Sources of Vibration in the Real Environment. 5.8 Response of Electronic Equipment to Vibration. 5.9 Vibration Testing . 5.10 Vibration-Test Fixtures. Summary and Questions. References. 6 Achieving Environmental-Test Realism. 6.1 Overview. 6.2 Environmental-Testing Objectives. 6.3 Environmental-Test Specifications and Standards. 6.4 Quality Standards. 6.5 The Role of the Test Technician. 6.6 Mechanical Testing. 6.7 Climatic Testing. 6.8 Chemical and Biological Testing. 6.9 Combined Environment Testing. 6.10 Electromagnetic Compatibility. 6.11 Avoiding Misinterpretation of Test Standards and Specifications. Summary and Questions. References. 7 Essential Reliability Technology Disciplines in Design. 7.1 Overview. 7.2 Robust Design and Quality Loss Function. 7.3 Six Sigma Quality. 7.4 Concept, Parameter and Tolerance Design. 7.5 Understanding Product Whole Lifecycle Environment. 7.6 Defining User Requirement for Failure-Free Operation. 7.7 Component Anatomy, Materials and Mechanical Architecture. 7.8 Design for Testability. 7.9 Design for Manufacturability. 7.10 Define Product Distribution Strategy. Summary and Questions. References. 8 Essential Reliability Technology Disciplines in Development. 8.1 Overview. 8.2 Understanding and Achieving Test Realism. 8.3 Qualification Testing. 8.4 Stress Margin Analysis and Functional Performance Stability. 8.5 Premature Failure Stimulation. 8.6 Accelerated Ageing vs. Accelerated Life Testing. 8.7 Design and Proving of Distribution Packaging. Summary and Questions. References. 9 Essential Reliability Technology Disciplines in Manufacturing. 9.1 Overview. 9.2 Manufacturing Planning. 9.3 Manufacturing Process Capability. 9.4 Manufacturing Process Management and Control. 9.5 Non-invasive Inspection Techniques. 9.6 Manufacturing Handling Procedures. 9.7 Lead-Free Soldering A True Perspective. 9.8 Conformal Coating. 9.9 Production Reliability Acceptance Testing. Summary and Questions. References. 10 Environmental-Stress Screening. 10.1 Overview. 10.2 The Origins of ESS. 10.3 Thermal-Stress Screening. 10.4 Developing a Thermal-Stress Screen. 10.5 Vibration-Stress Screening. 10.6 Developing a Vibration-Stress Screen. 10.7 Combined Environment-Stress Screening. 10.8 Other Stress Screening Methodologies. 10.9 Estimating Product Life Consumed by Stress Screening. 10.10 An Environmental-Stress Screening Case Study. Summary and Questions. References. 11 Some Worked Examples. 11.1 Overview. 11.2 Thermal Expansion Stresses Generated within a PTH Due to Temperature Cycling. 11.3 Shear Tear-Out Stresses in Through-Hole Solder Joints. 11.4 Axial Forces on a Through-Hole Component Lead Wire. 11.5 SMC QFP Solder-Joint Shear Stresses. 11.6 Frequency and Peak Half-Amplitude Displacement Calculations. 11.7 Random Vibration Converting G2/Hz to GRMS. 11.8 Accelerated Ageing Temperature Cycling and Vibration. 11.9 Stress Screening Production Vibration Fixture Design. References. Appendix 1: Physical Properties of Materials. Appendix 2: Unit Conversion Tables. Index. The author has worked for forty three years in the fields of Environmental Testing, Quality and Reliability and Environmental Stress Screening. Since 1996 he has worked as a Reliability Technology consultant to some leading telecommunications and aerospace industries. Before becoming a consultant Norman served for five years as European Product Assurance adviser to Nortel Networks Limited. Mr Pascoe has presented papers at seminars and conferences in North America, the UK and other European countries. He became a member of the Society of Environmental Engineers in December 1987 and was elected a Fellow of the Society of Environmental Engineers in April 1998.